Matthew Wilson has been the Chief Advisor and Chief of Staff to the Executive Director of the International Trade Centre since 2013. He is responsible for providing strategic advice to the Head of the ITC and ensuring the effective outreach, coordination and running of the Office of the Executive Director. Prior to this he served in the Cabinet of Pascal Lamy, Director-General of the World Trade Organisation where he was responsible for Development issues, Aid for Trade, trade facilitation, trade finance and the relations with the Africa, Caribbean and Pacific countries. 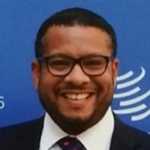 Mr. Wilson had previously served as Deputy Aid for Trade Coordinator at the WTO and was a trade negotiator and diplomat for the Government of Barbados for 8 years at the Permanent Mission of Geneva to the United Nations. In this role he was a lead negotiator on trade, labour and human rights matters. He was the inaugural ‘friend of the chair ‘ for the Trade Facilitation special and differential negotiations, the Chair of the ACP working group on EPAs and Vice Chair of the Committee on Subsidies and Countervailing Duties, Vice Chair of the Safeguards Committee and Vice Chair of the Anti-Dumping Committee. He started his career as a Foreign Service Officer at the Ministry of Foreign Affairs and Foreign Trade. He has a MSC degree in International Development, MSC Post-Graduate degree in International Relations and a Bachelor degree in Psychology and Sociology. He is a Chevening Scholar and an alumni of the University of the West Indies and the University of Bath.